You cannot read your name. You cannot sign your name. You are an X with a thumb print. Life is not full of opportunities for you. You haven’t learned your numbers? Using a cell phone is nearly impossible. You are short changed in the market. Instructions for taking medication properly are not understood. No one values your opinion because you don’t know or understand anything. If you travel somewhere new, how will you find your way? When someone says you have no legal rights, are they telling the truth? Afghanistan has many problems and many will say there are more important things than literacy in the fight for survival. I think about my conversation with the ladies at the Marastoon and remember that their world is so small that they “do not even know what to wish for”. What would they wish for if they could read the news, find out what the rest of the world is doing? Can one survive without literacy and numeracy? The answer may seem to be yes, although such a life might be considered sub-human. It is hard to think about donating money for someone to learn to read when you know they are hungry – but feeding the mind, like teaching someone to fish, may be the better gift. The Linda Norgrove Foundation has been keen to support literacy from the very start. It is all the stories of failures and even threats to the teachers and students that have given them pause. After many months and many conversations, they are ready to begin this work with a strong partner to show them the way. The Canadian Women for Women of Afghanistan (CW4W Afghan) are firm in their commitment to bring education to the women and girls of Afghanistan. And, if they bring a few men and boys along with them, that is ok too. The Canadian women have found a model that works. Find a community willing to embrace the concept of education for all of its members, identify a committed teacher known to or approved by the village, provide training, supervision, a room to meet, heat in the winter, basic supplies, add a library in a box and you have a village literacy program for the young and old. Another success factor – attend class every day. Everyone works hard in a village – even the children. Experience has shown a short class every day results in a higher success rate that a longer class fewer times a week. From one village, then two, word of the classes’ success has spread and now four more villages in the valley want classes and libraries of their own. 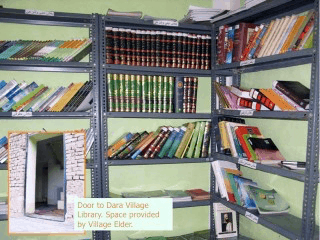 It has taken time to identify teachers, find space, and raise money but finally CW4W Afghan and the Linda Norgrove Foundation are ready to start in partnership this new project – ‘Village Literacy Centres and Libraries. Each village has approximately 35 women and girls who are already pre-registered for the classes. This project will benefit approximately 250 Afghan women and girls over the next 12 months and a further 3,000 villagers will benefit from the library resources. Please read, watch and support us as we tell the stories of these determined students. We can read academic papers about the projected impact literacy will have on a village but now, we have the opportunity to witness this for ourselves. It will be a long difficult road with many discouragements along the way but I am excited to be a part of this endeavour even in a small way. I hope the stories will capture your imagination as the imagination of the students grows with every new word they learn.